***Please note that not all courses are offered every year. Please refer to the appropriate Academic Timetable for current course offerings. Or Click Here [PDF 182KB] to view the 2019-2020 IDS Undergraduate Class Offerings. The importance of an understanding of biology for informed contribution to sustainable development cannot be over-emphasized. Geology lies behind many of the environmental problems facing humanity today - while energy and mineral resources provide an underpinning of many of the development plans of Third World nations. A grasp of economic frameworks whereby societies allocate resources (human resources and capital) is a prerequisite for understanding development plans and national prospects, development projects and foreign aid, and the constraints and possibilities for sustainable development. Language skills are obviously important for effective communication for those wishing to pursue international development studies; but through the study of languages and literature, important insights about culture and development experience are also to be gleaned. 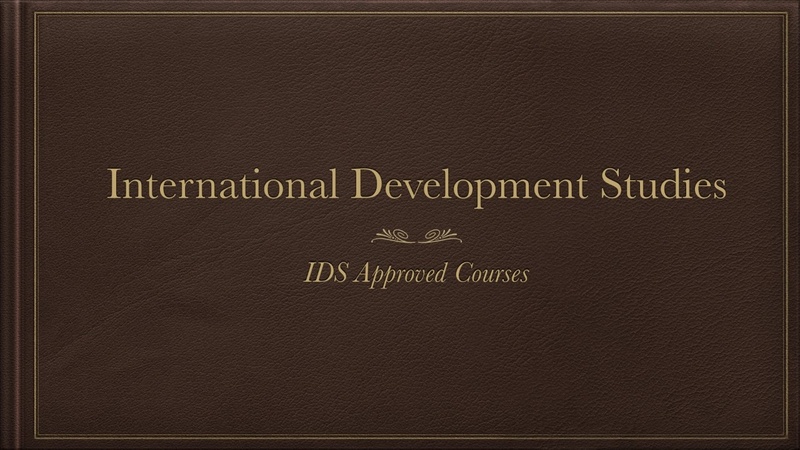 The IDS program encourages students minimally to study one additional (relevant) language to English. Most environmental scientists have primary expertise in a particular discipline and work cooperatively with specialists from other disciplinens to solve environmental problems. Dalhousie now offers a minor in both environmental studies and science. However, current programs that also provide courses emphasizing environmental subjects include Earth Sciences (geology and hydrogeology), marine biology and POLI 3585.03. It is important to recognize the implications of gender issues and to be sensitive to how these are viewed in different cultural circumstances. Hence, students are strongly encouraged to participate in at least one of the following GWST courses. Just as people need to know who they are and how they arrived there, groups, races, courses, states and nations need a sense of their own past as part of their culture and to guide their future development choices. HIST 2712.03: Freedom Fighters or Terrorists? Issues in International Development are fundamentally concerned with principles of ethics and justice. Philosophy provides students with the necessary foundation to think about these principles and apply them to international issues in an informed way. Political Science is critical for individuals who want to know more about the values, laws, institutions and policy mechanisms that govern their lives in society, and, as well, the differences between their systems of government and those in other countries. POLI 2302.03: Comparative Politics IIL The Developing World. Understanding religion and its influences on human behaviour involves grasping both the meaning of faith in the lives of participants and the critical analysis of outside observers. It has important implications for international cultures and development questions. Russia and the Soviet Union have been important players on the world stage for many centuries. The history and current situation of this region has had profound importance for the development of both Europe and Asia, as well as the developing regions. The study of this region is increasingly important to development theory, practice and planning. Sociology provides a context within which students learn to think critically about their social environment. Social Anthropology aims at generalizations by comparing structures and processes in major institutions within societies (kinship, political, economic and religious) as well as between societies. SOSA 3052.03: Indigenous Social Health and Environmental Issues. Span 3408.03: The Cuban Development Model. Complex global issues like water and energy security, climate change, environmental degradation touch virtually every person, every profession, everywhere. Solutions require passion, commitment and real knowledge.